CHAIN POLE SAW, GAS POLESAW W/ EXTEN. EXTENSION LENGTH - 6'4" WITHOUT EXT. 10'2" WITH EXT. 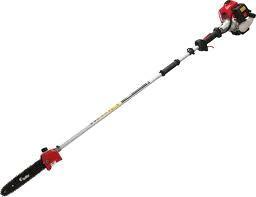 * Please call us for any questions on our chain pole saw gas polesaw w/ exten. rentals in Toledo OH and Perrysburg OH, serving the Toledo metro area.